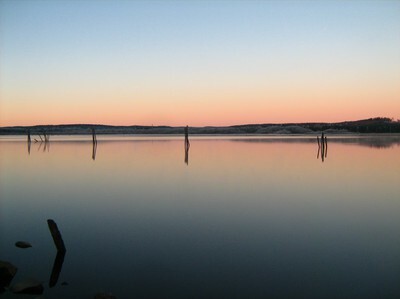 The fishing from the banks of Klarälven is now impossible as there is ice allover. But fortunately the nearby lakes are covered with a layer of ice - currently around 8cm. So we started the ice fishing season this afternoon at Acksjön. Temperatures were at minus 8°C and a chilly northerly wind made it feel even colder. 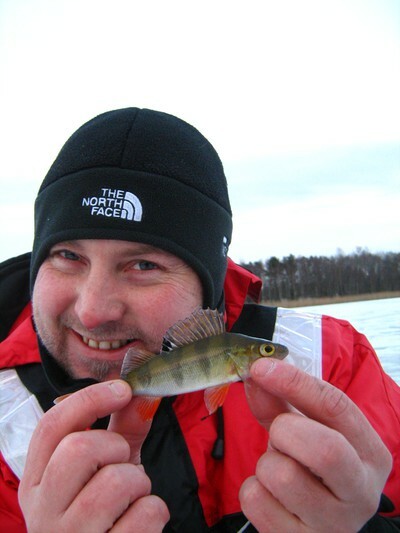 Just 4 perch were taken - by Johan & “Gubbe” - but the season has just started. 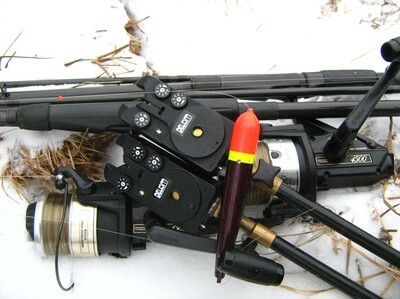 The methods applied ranged from classical small spoon to mormyschka and vertical jig sweetened with maggots. The ice fishing will also be more comfortable especially when being properly equipped with some warmer footwear.... An Irish Coffee in front of the TV of well heated Bergsgården compensated us for the slow fishing. The Sunday piking was an unspectacular outing with only one fish being caught. The low water level made it difficult to let the float rods work properly and the cold northeasterly wind was really annoying. If temperatures remain that low the ice fishing season should start very soon. Now the fishing is getting really tough. After the snow melt the water temperature is at 1°C. The jig fishing yesterday and today ended up with lots of lures being lost to snags. 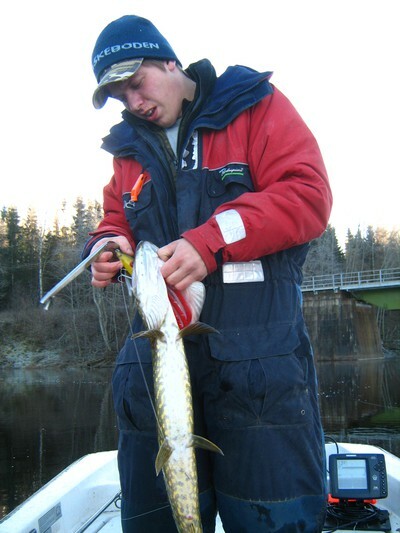 A float-fished smelt gave response twice but at both times the pike came off after playing it for a while. The same curiosity was now reported to me by a colleague who float-trolled the river earlier this week. 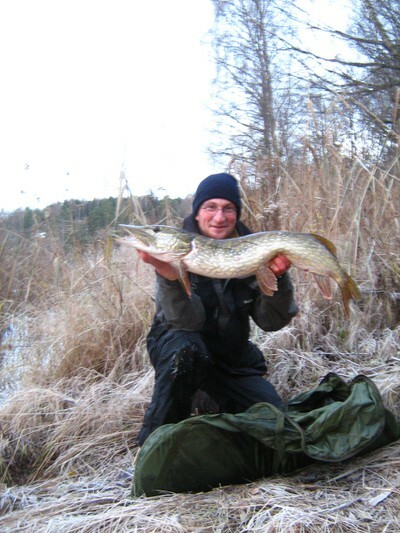 But at least last weekend we took three pike from Lusten. Two on float trolled smelt and one on tailbait. The alarm clock rings. It's 5.15 a.m. Crazy to get up that early as others might think. But John and I want to make sure we have our deadbaits in the water by 6.30. At 7.30 my rod is bent. Just five minutes later there's a pike lying on my unhooking mat. The scales show a weight of 5,5 kg. At the end of the fishing day this fish will almost be forgotten - thanks to John. Less than one hour after my fish he is playing a fish as well. He has meanwhile switched from baitfishing to spinning tactics. But surprise, surprise it's not a pike! 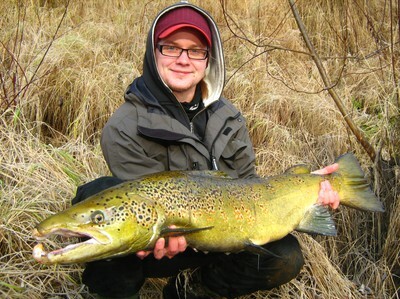 It's a trout of 6,9 kg. But after that John managed to catch an even bigger fish. See below. The scales this times stopped at a weight of 7,8 kilos - what a salmon!